Equipoise (Boldenone Undecylenate) 10ml – 250mg/ml. Buy euipoise in Canada from Alpha North Labs. A domestic steroid source. 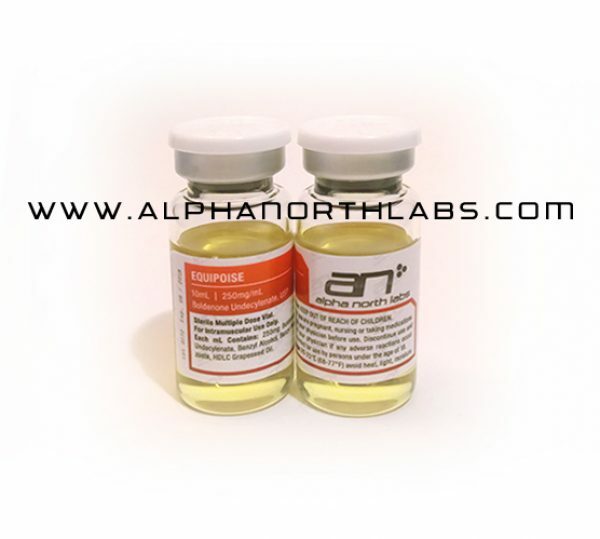 Alpha North Labs Equipoise is a derivative of testosterone, which exhibits strong anabolic and moderately androgenic properties. The undecylenate ester greatly extends the activity of the drug (the undecylenate ester is only one carbon atom longer than decanoate), so that clinically injections would need to be repeated every three or four weeks. This compound is also said to shows a marked ability for increasing red blood cell production, although there should be no confusion that this is an effect characteristic of newly all anabolic/androgenic steroids. The favorable properties of this drug are greatly appreciated by athletes, making Boldenone a very popular injectable in recent years. Equipoise is a veterinary drug used in horses. It used to be used in clinical trials but was discontinued. Estrogenic side effects include the following: water retention and bloating, blood pressure elevations (as a result of the water retention), increased possible fat retention/gain, and gynecomastia.